Fauziya Kassindja was born into a hard-working middle class Muslim back-ground, in Togo. Her life was smooth sailing until her father passed away. Her paternal aunt and uncle, who never got along with her family, banned her mother from the house, while she was forced into a polygamous marriage at the age of seventeen. As far as her husband was concerned, she must go through the genital mutilation before he could fully take her in as his wife. Even though FGM is wildly practised among young women in Fauziya's tribe, her late father found it repugnant. However, since he was dead, his opinion did not count. Fauziya found herself on the horns of a dilemma. Fortunately, her elder sister helped her escaped the country through Ghana, Germany and eventually, she landed in the United States of America. Where she was immediately thrust into prison and treated like a criminal and was told in no uncertain terms that FGM was not qualified as a basis for asylum. She was trapped in a nightmare. "Do They Hear You When You Cry" mainly narrates Fauziya's ordeal in the prison of the United States of America. She was humiliatingly stripped naked to be searched and forced to have exposed showers. She was unnecessarily sent to isolation cells, served meagre meals, surprised with dorm search in the middle of the night and was never allowed to see the daylight. As was expected, her health deteriorated, hovering between life and death. Her experience was beyond belief. Luckily, Karen Musalo and the young law student Layli Miller Bashir, together with the legal team from American University's Washington College of Law, fought tooth and nail for her asylum, and consequently restored her to life. Thanks to Fauziya Kassindja's case, the USA now recognises FGM as a basis for asylum. The reason why detainees or illegal immigrants would be treated like criminals, imprisoned, physically and emotionally abused is completely beyond me. I am baffled that such a thing happened in a developed and advanced country like the United States of American, where I assume there is a full awareness of human rights. 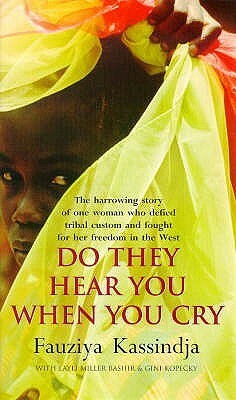 "Do They Hear You When You Cry" was wholly a thought-provoking and a compelling read. An eye-opener and a ground-breaking novel. My only qualm was its length, which I found overly long. In my opinion, I do not see the point of narrating a story in 689 pages if the same impression could be given in 300 pages. At the end, I found myself slightly exhausted. Apart from that, I highly recommend. I haven't read any story by a Togolese writer, more because I haven't yet come across one. I was left dumbfounded, there was actually no need of physical abuse. Well, through constant reading one ends up taking the veil. It is just a shame. I would not consider Fauziya an official Togolese writer, you know it's a non fiction. She was simply narrating her life experience in the prison of the USA. Wow, is what I kept saying when I read your review. It sounds like a fascinatingly horrific experience for a person to go through. Nana, it absolutely was.. dreadful, and a true life story. This is a sad story that takes one through different multicultural perspectives with varying political aspects sandwiched between cultures. I wish I cold get hold of this book. David, hopefully you would. It was a temperamental read. No one hears the cry of the down trodden and the so called advanced nation still look down of Africans though i wouldn't blame it on the Advanced nation but over leaders in Africa who trample on the rights of their citizens.....Thumps up Mary for the review. Olorunyomi, thanks for dropping a note. You made a point here. I'm not really surprised, Mary, at the inhuman treatment that Fauziyah had to go through. Sometimes I get the feeling that all that we hear and see about the US is hyped big time. Anyway, I think this is is powerful write and I would love to read it. I agree that 689 pages is rather long but then her story had to be told. Great review, Mary. My dearest Afua.. your point is unarguable.. her story defnitely had to be told. Its a non fiction.. I hope you get to read it. I would like to know what you feel about it. Kboy, thanks for stopping by. Though I do not share any of your opinion. No matter how imperfect a system is, there is no reason whatsoever (illegal) immigrants should find themselves behind prison bars. They aren't criminals. I would advice you not to give your credit to any body yet, if you haven't read the book. We are talking about two different things here.. they should detain who they have to.... however, there is absolutely no need of humiliating and mistreating anybody in the process, as simple as that. The fact that one is detained is already a nightmare... no need to add to that. A democratic country fully aware of the human right must act like one. She surrendered herself upon her arrival at the airport. I am not against following establishes immigration procedure.... I am an imigrant myself as well... and I must say that humiliation, racism, clasism and insults, physical and emotional abuse is and must not be part of it.